Inside the home greenhouse, locked within the spring-like atmosphere, is the potential for an endless parade of outdoor bloom. In range and magnitude the flower power inside can far surpass the display contained within a greenhouse at any given period. The gardener holds the key which will unlock this potential, provided they knows how to make the most of it. Three fundamentals are involved in coordinating any outdoor display with the incubation possibilities of a home greenhouse. These include the overall plan, proper equipment, which need not to be elaborate, and a schedule of operations to provide a smooth flow of plant material from greenhouse to outdoor flower garden. Fortunately, all gardeners do not think alike when it comes to favorite flowers. Any display, of course, must have some elements of originality. We can suggest the kinds of plants to use, but the actual plan must be tailored to fit your gardener/landscape preferences and available greenhouse and garden space. Because of their long season of bloom, annuals generally constitute the greater part of the plan. An early start in the back yard greenhouse will advance their season of bloom from one to two months. Biennials, naturally, have a more restricted flowering period. When grown in the outdoor garden, they need a full year to reach the flowering stage, but with a greenhouse, this period can be reduced. Perennials, with their limited blooming period, are generally most effective as accents in the overall plan. Old clumps of many favorites can be divided and conditioned in a greenhouse. Thus, many new plants will be ready to bloom outdoors before their winter-bound relatives have begun to grow. The bulbous, rhizomatous and tuberous sections of plants may also be given an early start to enable them to be ready to bloom shortly after they are shifted to the garden. A greenhouse is the starting point for most plants destined for the outdoor garden, though it serves, too, as a permanent home for strictly indoor plants. A few might feel they have sufficient bench space, but these are rare. If deciding to buy a new greenhouse, plan to have more space than you think you will need. In greenhouses with a center bench, a removable frame may be constructed between the bottom of the center bench and one of the side benches to provide more space. Flats of seedlings and potted bulbs may be placed there during the spring rush. Whenever a greenhouse runs north and south, shelves may be located along the eaves above the side benches. The plants in the benches under the shelves will then be only partially shaded as the sun moves from east to west. Decreasing widths of shelves may be erected across the north end of the greenhouse to provide room for low-growing potted plants. Even the area under the benches may be used to store pots of tubers and bulbs while they are making their initial growth in the warm atmosphere of the greenhouse. A coldframe, almost as important as the greenhouse, provides a transitional environment between the greenhouse and the outdoor garden. In the spring, it can be used to condition young seedlings and tender rooted cuttings when the greenhouse is bursting at its seams and weather outdoors is variable. During the summer, a coldframe is ideal for late-blooming potted plants to be planted in the garden later. To protect potted plants of chrysanthemums, intended for the greenhouse, from frost is a fall function of the coldframe. Finally, in the winter, it provides protection for potted hardy bulbs, perennials, which have been lifted from the garden, and such plants as pansies, which will stand below freezing temperatures. The coldframe thus becomes an integral part of the process. As a general rule, it is advisable to have at least one half as much coldframe area as the bench area in the greenhouse devoted to plants for the outdoor garden. Coldframes can be built in many ways, although the type of construction depends upon the severity of the winter weather. The bottom may be below outside ground level, with a base of crushed cinders, or it may be level, with a base of bare ground or sand. Sides may be wood or cinder block, with additional insulation provided in colder climates. The glass of the coldframe should be slanted at an angle of no less than 30 degrees to provide good run-off of moisture. In addition, it should face south in order to receive maximum light. In the mid-Atlantic area, wood is adequate, with a 6-inch layer of sand for the base. If pots and flats are buried in the sand at the bottom of the cold-frame, moisture is reduced to a minimum. Usually a thorough watering when sashes are closed in the late fall will carry plants through the winter without additional water. The time it is safe to plant outdoors varies with each section of the country, even in the same latitude belt. No one schedule can be offered, and each gardener must relate to the average date of the last killing frost in their area. Most annuals and perennials will require conditioning for one month in the coldframe before it is safe to plant them in the open ground. To produce plants mature enough to withstand the change from greenhouse to coldframe will require an additional period of two to five months. Slow-growing annuals, such as cape-primrose (streptocarpus), require five months of greenhouse culture. Petunias, stock, snapdragons and other hardy annuals need approximately three months before they are to be transferred to the coldframe. With faster growing kinds, like marigolds and zinnias, allow two months from seed sowing time. Also to be considered is whether the greenhouse is kept cool (45-55° F.) or warm (55-70° F.). hardy annuals, which make slow, stocky growth in a cool greenhouse, are prone to grow soft and lanky in a warm house. In that case delay planting a month. Bloom in the garden will be postponed accordingly, but plants will look healthier and be better proportioned. The combinations of plants, which can be moved from the greenhouse to the coldframe to the outdoor garden, are endless. However, there are some which are more suited than others. Almost every flower border needs an edging of colorful, low-growing plants to finish it off. 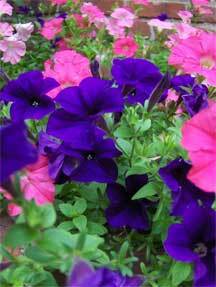 Pansies and annual phlox are suitable. If you want pansies, sow seed in the coolest part of the greenhouse or coldframe in late August or September and transplant to deep flats. After a month keep in the coldframe, with the glass removed, during the good growing weather in the fall. Then, when below freezing weather approaches, replace the glass. In very cold areas, place old rugs or carpets over the glass to give added protection. In the spring, transplant the pansies to the border when the first robin appears, where they will bloom until hot weather. Then, phlox, started from seed in March, can be used to replace the pansies. Chrysanthemums, most versatile perennials for the greenhouse to garden program, because they grow easily from cuttings, can provide bloom throughout most of the year. For specimen plants start cuttings in the greenhouse as early as February, although May is not late to produce well developed plants by fall. After strong roots appear, plant cuttings in two-inch pots and repot when the roots have formed a network on the inside pot surface. During the summer, leave plants in the coldframe, and in September transplant them from six or seven-inch pots to the garden. After flowering is past, hardy chrysanthemums can be left in the garden or lifted with other perennials for storing in the coldframe. Although cuttings make the best plants, root divisions can be made. On the other hand, fibrous rooted plants, like delphiniums, respond better to division. In late winter, remove perennials from the coldframe, bring inside to the greenhouse and divide for an earlier start. Annuals grown from seed will provide the summer-long backbone of the outdoor garden. Proper timing, which best comes from experience, is very important. In the list include fast growing annuals, like the single and double flowering dwarf dahlias, along with slow growing kinds, like cockscomb or celosia. In this way, space requirements of the seedlings in the greenhouse and the cohlframe will not conflict too much. Highly recommended for summer color are the dwarf dahlias, which bloom within three months after sowing. After blooming, lift tubers, store and give an early start again for bloom the next season. Gladiolus corms and Peruvian daffodil or ismene bulbs respond well to an early start in the greenhouse. Potted at intervals, they will provide a succession of bloom in the garden. Dutch bulbs, too, are favorite subjects for forcing in the greenhouse in the winter. Some may also be brought in from the coldframe and forced into bloom for planting in the garden. The idea is to provide flowers earlier than normal.